To many Hurricanes fans, opening weekend was just a normal start to the season with hopes of reaching the College World Series come June. 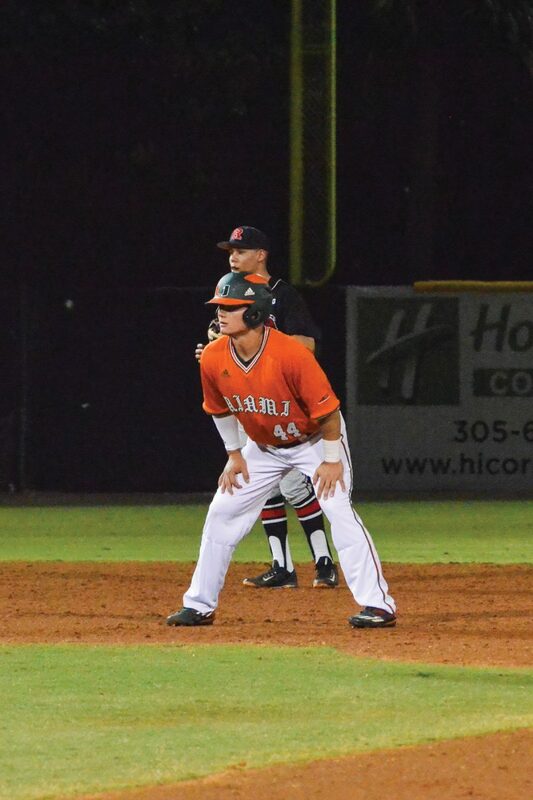 However, for University of Miami junior outfielder Michael Burns, this year means so much more. For Burns, playing on the fresh-cut grass and the smooth, orange clay paving the 90-foot base paths at Mark Light Field seemed improbable just one year ago. During his sophomore season at Cisco College, a junior school in Texas, Burns developed a “bump” on his left leg. Burns didn’t think it was anything serious and kept playing, hitting .363 in 30 games. A visit from his parents would change the course of his season and life. Last March, Burns was out to dinner with his parents along with fellow Cisco transfer and best friend Jeb Bargfeldt. Bargfeldt brought up the bump on Burns’ leg to his mom. Anita Burns’ instincts told her something was wrong, and the next morning, she brought her son to the hospital. Burns underwent surgery to remove the abnormality in his leg. At first glance, doctors were unsure what it was, but ultimately, they diagnosed the bump as myxoid liposarcoma – a rare form of cancer. Following the procedure, Burns underwent 37 radiation treatments running through July 2016 and now has a 17-inch titanium rod running down his left femur. While the odds seemed almost insurmountable at one point, Burns overcame the hard-fought battle. He credits his friends and family for helping him through the difficult time. Burns, who committed to UM before the procedure, feels right at home in this Hurricanes lineup. Burns has started every game in right field for Miami so far and picked up his first hit as a Cane against Rutgers on Saturday night. He finished with a two-hit, three-RBI game as the Hurricanes won 8-4. The victory was nice, but to Burns, just playing baseball again was more than enough. Burns is also enjoying the experience of playing in Miami’s historic home turf. Burns and the Hurricanes will visit Gainesville to take on the Florida Gators this weekend.